Slash jammed in the studio yesterday with Dave Grohl and Duff McKagan on a track for his upcoming solo album. But even before the three got together, the guitarist felt good vibes in the air. "Doing a track for my record with Dave Grohl on drums & Duff on bass tonight, it promises to be killer," Slash posted on his Twitter page. Apparently, things went swimmingly, for Slash later added: "Great jamming w/Duff & Grohl tonight, the track is a killer instrumental, very heavy." What with overseeing the soon-to-be-released Foo Fighters' Greatest Hits and drumming with his new supergroup Them Crooked Vultures, it's amazing Dave Grohl can fit a session into his schedule. Ah, the life of a jet-set rock star. 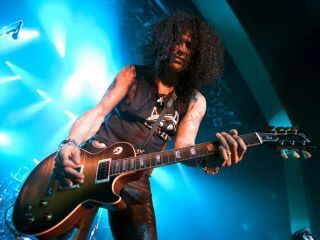 As for Slash, his solo disc boasts more than its fair share of big-ticket names: as of this writing Fergie, Chris Cornell, Iggy Pop and Ozzy Osbourne have contributed vocals, while players include drummer Josh Freese, Flea and fellow ex-Guns N' Roses mate Steven Adler. Meanwhile, the search for a new Velvet Revolver singer continues.